Robin H. your number was picked! You get a two-pound bag of Mocha Roca Mishaps. I feel like I should apologize. That’s a lot of Roca! Dishboy Scott introduced this pudding to me. He’s been making it since he was a kid from his favorite dessert book, the 1960 “Better Homes & Gardens Dessert Cook Book”. Scott still likes to make this pudding and drizzle it hot over cold vanilla ice cream. Sometimes we get lucky and he makes this for us. I had no idea hot pudding and ice cream could be so incredible together. But if you like your pudding cold be sure to chill it with a piece of plastic wrap directly on top so a skin doesn’t form. This old dessert book is a gem in the Better Homes and Gardens collection. I finally found a copy of my own so I can pass these nearly lost recipes to my daughter. I’m left wondering how advertising conned us into believing pudding came from a box. It must have taken awhile, because this is such an easy dessert. Growing up though, I thought pudding only came from a little box. I’m grateful I know better now. In saucepan, mix sugar, cocoa, cornstarch, and salt. Gradually blend in milk. Cook over medium heat, stirring constantly, till mixture thickens. Cook 2 to 3 minutes more. Add vanilla. Pour into 5 or 6 sherbets; chill. Or pour into individual molds, rinsed with cold water; chill till firm. Unmold in chilled dessert dishes. Serve with cream. *Or add two 1-ounce squares unsweetened chocolate, cut up, along with milk. Notes: Directions are from the book, but you can serve this warm as a sauce over vanilla ice cream or you can place it in a bowl and cover and chill with plastic wrap directly touching the pudding so a skin doesn’t form. Recipe from “Better Homes & Gardens Dessert Cook Book”, 1960. Picture by Laura Flowers. Yes, there's a huge difference between that boxed stuff and the real thing. Thanks for posting this delicious recipe and great photo. Makes me crave chocolate pudding for breakfast. I never considered chocolate pudding out of a box either. Great to see the real thing ! Makes you want to form a march while holding pickit signs in front of the boxed pudding aisle! Looks scrumptious- easy and delicious. How have they fooled us in to believing a box is better? I've never tried it over ice cream. One more fattening treat to add to my loooooong list! Thanks. Yum! I love pudding but (having also been raised on the boxed pudding theory) really don't care for the artificial aftertaste. Will have to try this on the weekend! Even if you didn't like chocolate pudding, this photo would make you do crazy things to get it! Excellent. Oh, this looks and sounds delectable! Yum!!! I've yet to make chocolate pudding!! I've never heard of putting hot pudding on ice cream. Wow. I must try this out!! Thanks for posting this, Laura!! ciao!! devo gustarmi la foto meravigliosa..sei troppo lontana per arrivare in tempo!!! baci!! I've never made pudding, I don't know why. Thanks for the reminder. It looks delicious! Congrats to Robin. Lately, every time we leave our son home alone he makes chocolate pudding. His recipe uses egg yolks and I'm left with a bowl of egg whites(he then begs for coconut macaroons). I'm printing this recipe out for him. The pudding photo really makes me want to make a chocolate cream pie! Wow, homemade chocolate pudding! That sounds terrific!! Wow thats so easy and luscious pudding! The hot pudding and icecream combo sounds fantastic... a bit like those volcanic pudding cakes my mom made when I was a kid! This reminds me of my mom...she used to just fly in a 'I am making something sweet mood' and you never knew, but when the milk came out in the big pot...we knew...Pudding! Yummo! Looks even easier than my egg yolk version. Oh, geez, Laura!!! That looks sensational! Yum :) Although you may be wondering when advertising made us think pudding came out of a box, I'm wondering when and why cooks eschewed eggs and a teeny bit of flour for blech-cornstarch. Eggs are the superior pudding-maker-thickener. Good point. Maybe when cornstarch was able to be used as a thickener when eggs were expensive in winter? Eggs are better, no doubt, but this is good too. Just like brownies and cakes, I always wonder why people make pudding from a box. It's just not that hard to do any of it. Sometimes I laugh when a box asks for most of the ingredients that a "from scratch" recipe calls for....so then what is the point?! Thanks for the reminder and recipe...looks great! There is nothing better than homemade pudding. Box pudding is a crime against humanity!!!!!!!!!! The chcoloate pudding looks wonderful. Really, pudding with your ice cream? I definitely have to try that, sounds sinful. Delicious. 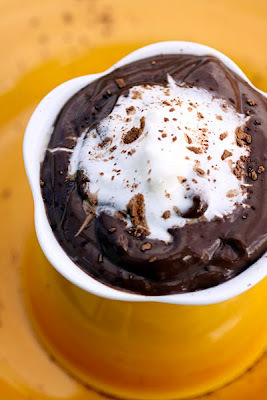 I'm drooling for this chocolate pudding! What a classic! I only learned late in college that making pudding was so so easy. Even if you go with a richer egg version, it's not that tough and way healthier than getting the chemicals in a box. This looks soul-satisfying for real. I made this last night and it never pudding'd. I may have to eat as a syrup. It tastes good, but it's still liquid after chilling overnight. I'll check on it after work. *sigh* Looks like I'll be sticking to appetizers and side dishes. I just wasn't meant to do desserts. Try turning up the heat on your stove until the pudding comes to a good simmer. Then cook for a couple minutes more. You have to stir the whole time through this. The cornstarch might just really need to come to a good simmer before it works as a thickener. I hope you'll try again. This one you really can do. I haven't quite given up yet. Luckily, it's made with pantry items and doesn't take long so I may whip up another batch tonight and see what happens. SO GLAD i found your site! I specifically did a search for this recipe and your blog came up! Tried it today and ate almost the whole thing to myself! thanks! I'm so glad you liked the pudding! This pudding taste great. I have made it 3 times. The last time I made it I doubled it! Thanks for the recipe.